The court found the degree of the accused’s culpability resulted in the cold-blooded assassination of a young man. A former police constable convicted of culpable homicide after he handed over his official firearm to a known gangster, and the weapon was later used in a murder, was on Friday sentenced to an effective six years behind bars in the Port Elizabeth High Court. Earlier in July, Walter Francis was convicted of culpable homicide. He was acquitted on a charge of murder. The court found the degree of the accused’s culpability resulted in the cold-blooded assassination of a young man, Denton Rademeyer, who was shot dead with the constable’s service pistol. During October 2014, Constable Walter Francis, 28, Enzorich Kroates, 22, and Clement Kogana, 29, were at the home of Shane Potberg, 34, when a shooting incident occurred in Bloemendal. Following the shooting incident, Francis who was stationed at Humewood Police Station gave his official police firearm and several rounds of ammunition to Potberg, a gangster in the city’s northern areas. The next day, Potberg, Kroates, Kogana and another person drove to Bethelsdorp to “take out” rival gangster Rademeyer. 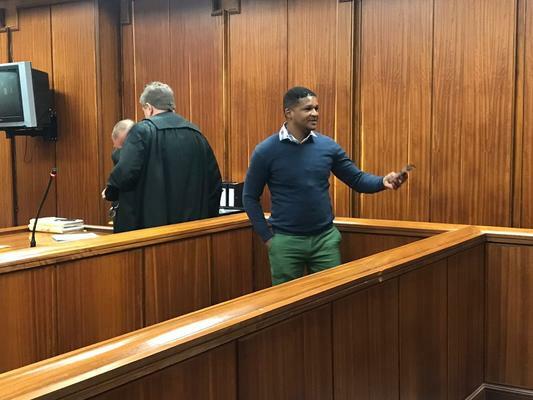 Passing down the sentence, Judge Jannie Eksteen said Francis was “grossly irresponsible” for entrusting his firearm with Potberg, who was associated with the notorious “Spotbouer” gang. Eksteen found that Francis knew at all times that Potberg was affiliated to the gang. The judge said the accused had taken no logical steps the next day to retrieve the firearm. He said that the former cop was well aware of violence and gangsterism in the city’s northern areas and as a trained police officer, had a responsibility towards the community. By handing his official firearm over, the court found that Francis negligently caused the death of Rademeyer. Eksteen said that a reasonable man would have foreseen that Potberg would have used the gun or handed the firearm over to other gang members in order to avenge the shooting that had taken place at his home. Defence advocate Terry Price had asked the court to impose a three-year sentence of correctional supervision, however, Eksteen considered that as inappropriate. The judge found that the accused showed no remorse, particularly when giving evidence during the trial. Leave to appeal both conviction and sentence will be argued on October 24.